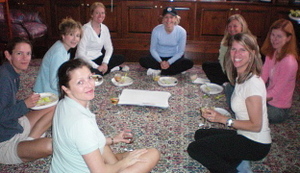 Here's a great combination - a bunch of really fun women, yummy mojitos and munchies and a Wii Fit! Cooper and I hosted Wii parties last summer for our friends and had a fantastic time, so we were psyched when Nintendo asked us to throw parties for the Wii Fit. First of all, let me just say, the invitation couldn't have come at a better time for me. I am in just about the worst shape of my life and have been bemoaning how bummed I am that bathing suit season is practically here and how bored I am at the thought of going to the gym, taking up running, or doing much of anything else to kick my sorry self into gear. It's a big drag and I haven't been doing a thing about it. For way too long. Soooo ... give me a new system that's fun, hilarious and totally distracting, and oh - it's a workout too - and I'm there. But, back to the parties. Cooper and I both had a bunch of girlfriends to our houses to try out the Wii Fit's 40+ games and exercises. Let me just say, you need to do this with your girlfriends. It was crazy funny. At my house, the highlights were watching Dottie do the ski jump, Priscilla boxing her heart out (with her sister Sara cracking up), Lianne doing some wild hula-hooping, Betsy getting a Wii Fit age that is five years younger than she actually is, and Jill balancing. Me ... well, my proudest moment was when I tried the ski jump, flubbed it and became a big rolling ball of snow with skis sticking out, crashing down the mountain. I've turned over a new leaf and am exercising like the old days, only this time I'm downhill skiing, running past waterfalls, heading soccer balls coming at me, and breathing through yoga positions -- all in my family room. Thanks Nintendo and to your great team that put the parties on! We had a blast and loved being a part of the roll-out of the Wii Fit. Your team of engineers are inspired and they've come up with one very cool system. We love it! So how did you do this Wii Fit Party ... just had everyone play under the same Mi person, or did nintendo send you a special version that allows multiple players? 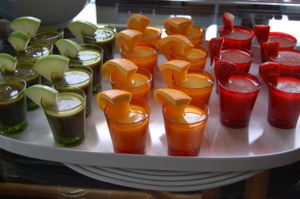 Those drinks/Jello shots look scrumptious. Do you share recipes? The Wii Fit would be a great way for my son and I to "work out" together. The sneaky "mom's way" of getting the child to exercise while he thinks he playing a game. Hey, we might even get dad out of the man's cave to join us! Wow, you guys seem to have so much fun. I missed entering your contest due to the fact that I was away on vacation. From what I have seen though, Wii Fit seems like a really great workout tool. Now to convince Hubby of the same thing ;). This game is absolutely amazing!!! There are 4 different types of training:Strength, Balance, Aerobics, and Yoga. You can track your weight and BMI using the balance board. It keeps up with your weight loss goals too! Nearly all of the exercises seem more like games than exercise, after nearly 2 hours of playing this morning I feel like I've done more than I ever had at the gym. Try the Hula Hoop game or the tight rope walk, they are my favorite so far. I used a Wii Fit for the first time at Christmas and played the hula hoop game. Oh my goodness i cannot tell you how much my calf muscles started to hurt. I definitely think it does provide some benefit and yes i think you can look like a pratt but most of all it's great fun! I wont be letting my girlfriend see this i cant bear the thought of a Wii FIt girly gathering.......only kidding. I am almost in the worst shape of my life, and complained how depressed and I am that season costume is almost here.